This recipe was made with simple and light ingredients. Few years ago I used bacon instead of vine leaves and Halloumi cheese instead of Edam Light cheese. I have to admit that I truly liked this version more than the previous one. It was light, very tasty and guilt free J !!! 1) Wash and boil the vine leaves for 2-3 minutes. Drain and allow them to cool down. 2) Boil the spinach. When all the liquid has evaporated, add the olive oil and spices. 3) With a meat hammer, lightly beat the chicken. Add the spices and herbs. 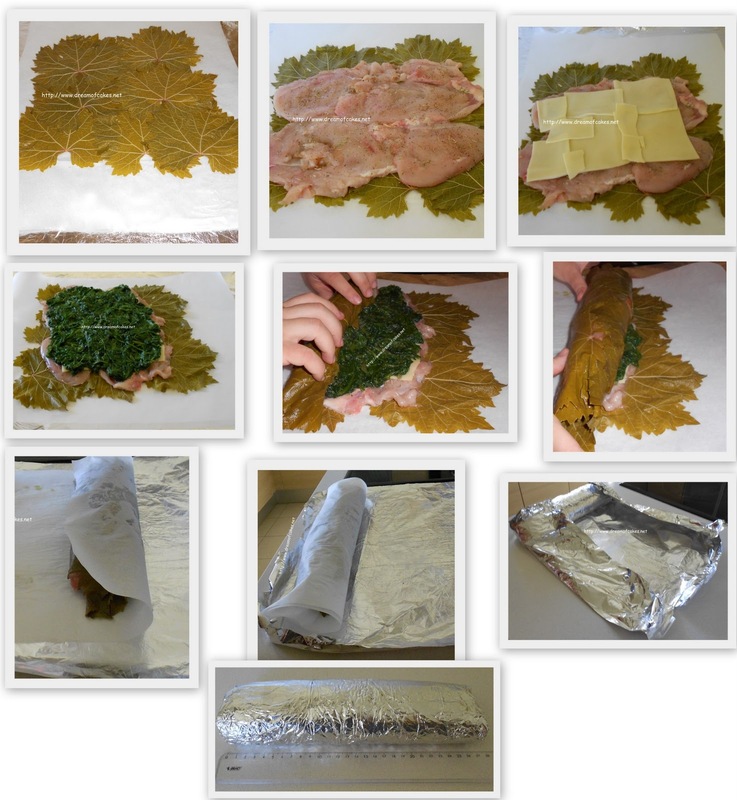 4) On a large piece of aluminum foil place the nonstick paper. 5) Spread the leaves on the non-stick paper and on top of the leaves place the chicken. 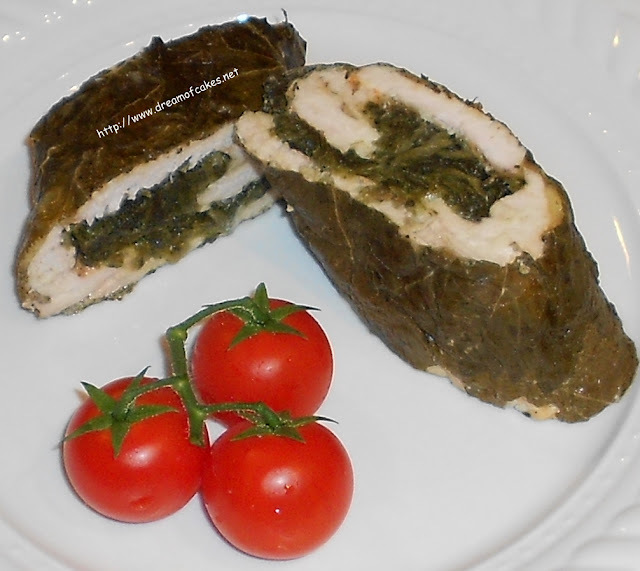 Place the slices of cheese on top of the chicken and then spread the spinach on top of the cheese. 6) Wrap the chicken roll * and place it in a Pyrex. Add 1 cup of hot water in the Pyrex. 7) Bake in a preheated oven at 220ºC for 40 minutes. Add an extra glass of hot water, and continue baking for another 40 minutes at 180ºC. 8) Allow to cool slightly before you cut the roll into slices, and serve. * The roll should be well wrapped in the foil so that the water will not penetrate the chicken. Oh, how fabulous! I love this combination...and so pretty when cut! A great guilt free recipe. I used to make it with pork and lamb but surely chicken is the best choice when on diet. Eftychia, now THIS is a dish! You're right, these are simple, light ingredients and the end results look sensational. I enjoyed the pictorial sequence...thank you for sharing and Happy Holidays! This looks so delicious! It reminds me of some of the dishes my mom makes :) And I like the step-by-step photos, great recipe! Hi Efty, your chicken rolls looks delicious and tempting. And so neatly wrap. This look really good and different than anything i've seen before! Yum! Love what you did here with the vine leaves-very creative. Also the filling to this does sound tasty. Thanks for posting this stunning as well as delicious savory dish! I would have never thought to use grape leaves! It's not often you post a savory recipe, so I KNEW I had to check it out! A great, light dish for when you're done overindulging this season. Beautiful! Looks Delish,can wait to try it! Wonderful, my talented, friend. Merry Christmas and a Happy New Year to you and your family. :) Thanks for visiting my blog this past year. May all your weight loss dreams come true in the New Year. Grape leaves are so delicious! I just love it! Thanks for the recipe, and a reminder to use such a great ingredient. Thanks to you, Eftychia, I am finally over my fear of baking something sweet. With my mom's support and help I've made a few cakes, and some cookies. Like Japanese sushi, only with chicken...wonderful! This looks so healthy and delicious at the same time !